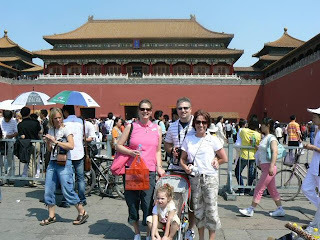 I discovered this picture on my online yahoo group after we came home from China last year. Another family had travelled to get their daughter in March 2007 (we were there in May) and they had taken pictures in the orphanage. They JUST happened to capture this photo of Mia and Jenna (another baby that was in our group). Wow. This is what they looked like then and what every day for them looked like one year ago. A look a her over a year ago - before she was ever even in our arms. And a look at her today. ONE YEAR AGO today we had our first "touring day" in Beijing. It was the day we encountered the desperation of many people. 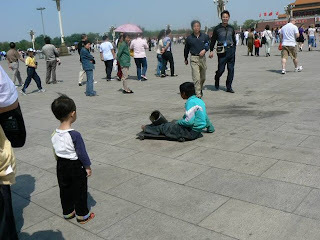 The man bowing and groaning over his child on the sidewalk ( who was supposedly sick and unconcious), the little boy with rotting feet rolling around on his skateboard begging in the middle of Tianemen Square... And this is the day that the entire trip went "south" for Brad. He was so taken aback by these things....that he withdrew into a cocoon for the rest of the trip. He was having a hard time processing...just the oppression of people...the sadness of the beggars.... AND I WAS NO HELP for him b/c I was TOTALLY focused on getting Mia and could NOT understand how in the world he could be acting that way when we were about to get our daughter. So HUGE communication breakdown - but that is all history. God has worked thru it and even made us better people b/c of it. 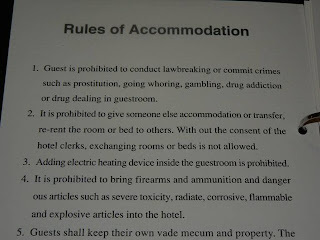 I can't remember if I posted this last year or not - but this is actually the first page that was in our "Hotel Guests" book in each hotel room: Note #1. Day 1 of the trip to China!